Saturday, Mar. 16, is St. Patrick’s Day this year, and Okinawa City has traditionally celebrated the Irish national day with a revelry on the Chuo Park Avenue area. This year, organizers have decided to try something quite different. 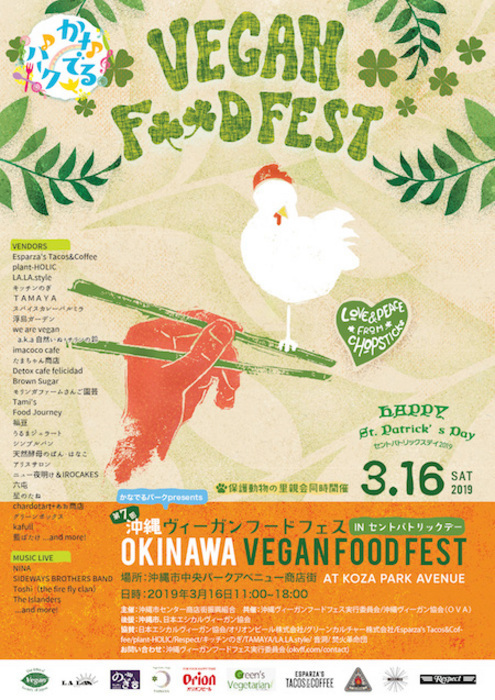 The main point of the event is collaboration with the 7th Okinawa Vegan Food Fest. The parade has also been done away with. The concept of the festival comes from the something called “Love & Peace from Chopsticks” that has been held in Okinawa since 2016, and that was the first time in Okinawa. The festival focuses on the wish of harmony with nature and animals and aims at spreading vegan lifestyle as the “choice filled with love” to “pass the beautiful earth to children of the future.” As a natural extension, the festival also is in effect an animal protection event. All food in the fest is vegan. There is also a animal adoption event that searches foster homes for animals rescued from animal shelters where they would be euthanized. Also, the fest a part of the earnings from the festival are donated to animal protection organizations. On stage, live performances featuring many musicians, including an Irish band, will provide entertainment for visitors. Food booths will serve a variety of vegan foods prepared by Okinawan began restaurants. There are also booths selling handmade crafts, all of them naturally made without using any animal-based raw materials. A stamp rally is prepared for children. The festival takes place on Saturday, Mar. 16th from 11:00 a.m. to 6:00 p.m. on Chuo Park Avenue. Admission to the event is free, but organizers emphasize that as parking in the area is practically non-existent, patron should use public transportation of walk to the venue.